Get your Polar Express aboard Pere Marquette 1225! The book’s popularity led to a movie released in November 2004. Michigan railroad buffs recognize the sound of the movie’s train whistle, which comes from one of the nation’s few working steam locomotives. Built in 1941, the Pere Marquette 1225 is an enormous steam locomotive, measuring one hundred feet long and sixteen feet high. Replaced in 1951 by a more efficient diesel engine, the 1225 was saved from the scrap heap and decades later, ended up in Owosso as the star of the Steam Railroading Institute (SRI). Shortly thereafter, the 1225 was restored to its former glory. As researchers prepared the movie version of Van Allsburg popular book, they were drawn to Owosso and the 1225. Technicians recorded the sound of the whistle, the clatter of the wheels and the rumble of the four-hundred-ton locomotive rolling down the tracks. The sounds were merged with the animated Polar Express. Check the photo out bigger and see more in Bob’s slideshow. More trains on Michigan in Pictures and also check out the Pere Marquette 1225 slideshow in the Absolute Michigan pool! I’m not sure of this, but I think the 1225 was at one time owned by the MSU Railroad Club and the engine was parked for several years near Spartan Stadium in East Lansing. A few years ago, the MSU club transferred the engine to the Owosso club. I also read about the time the Polar Express movie was released in 2004 that the whistle for the soundtrack was that of the engine formerly parked on the MSU campus. I was born and raised in Plymouth, MI, which has the north-south and east-west intersections of the former Pere Marquette running through it. As a kid I remember listening to the steam engines coming through town and I could count the crossings by the whistle blows as they traveled toward Detroit and could tell where the were. There was an up-grade going west out of Plymouth toward Lansing which required a pusher engine as an assist for the freight trains. I would listen at night while in bed as they chugged up the grade and then their big wheels would spin on the tracks trying to gain traction.. Our next door neighbor was an engineer for the PM Railroad. I’ll bet one of those engines I heard as a kid was the 1225. Interesting childhood, Dale! As a volunteer who works on the 1225, I can tell you that the information you have is right on track! Going into some specifics, Michigan State University owned the engine from 1957 until 1982 when it was moved off campus. At that time ownership was transferred to the railroad club which had formed a non-profit organization called the Michigan State Trust for Railway Preservation which exists to this day. The locomotive was taken to Owosso and restored in 1985. The trust wanted to ensure a future for the 1225 and other historic pieces of railroad equipment and so formed the Steam Railroading Institute in 2000 as its operational/educational arm. The Institute or SRI acquired land in Owosso between 2003 and 2004 for a museum and maintenance facility. Work on the Polar Express movie actually began with phone calls late in 2001. A year later, 1225 being the train in the movie was pretty much a done deal. Everyone at SRI was especially pleased to hear that Tom Hanks would be the star and also work in production of the film. When the movie was released in November 2004, it was decided to start running some annual Christmas trips out of Owosso. The North Pole Express was born. We decided to call it that because years prior to the movie, a tourist operator bought the naming rights from the book publisher. Therefore, although we have the “real Polar Express” we would have to pay a royalty. Anyway, these Christmas runs have been our most successful excursions. We used to take the train to Santa’s Village at the Saginaw County Fairgrounds. But due to track maintenance issues, we have a new destination this year at Ashley’s Country Christmas in Ashley. The locomotive is recently back in service after nearly four years of a major boiler overhaul required by the federal government. She is now running like new and will continue to bring smiles to the faces of old and young alike. I’m proud to say that I work on a piece of our past. Come out and see us. 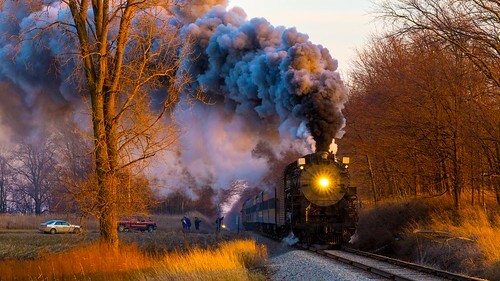 Here is a link to our website for more information: http://www.michigansteamtrain.com. Thanks for you additional historical information about the 1225 and its present ownership situation. Very interesting stuff, most of which I did not know. I now live in Florida but spend the summers in Michigan. I might take a trip over to Owosso next summer to see the engine. Back in the 1970s or 1980s, there was a steam engine which came through Plymouth frequently on excursions and I would take my two young daughters over to the depot to see it. We could hear the distinctive whistle well before it arrived in town. Not sure where that engine is now located, but I don’t think it was the 1225. I heard the excursions were stopped because of the high liability insurance premiums to run it. I remember when the P M RR switched from steam to diesel engines. We had a father and son team who lived a block of so away from us in Plymouth who worked for PM RR cleaning the fire-boxes and coal tenders of the steam engines. Our house was on their route home from the roundhouse and in late afternoon they would walk past in the street all covered with black soot from head to toe carrying their lunch boxes. If you lived in Plymouth, the railroad was always a part of your life because you could not travel by car from one end of town to another without crossing a railroad track. If you had an appointment on the other side of town, you had to allow extra time in case you got delayed by a passing train. It is still pretty much the same situation. But it had its advantage too, because it was a convenient and very believable excuse to use in case you were late. I was born in Owosso, grew up in Chesaning. I love the area and the trains. So glad they are still running. The Real Polar Express! Wow, what a machine! The University never transferred ownership of the locomotive to the MSURRC. Edgar Hardin told me that if we formed a 501c3, that the University would give us the engine, since it had no interest in running the locomotive. Aarne Frobom and I worked on the formation of the Trust and once it was going, MSU transfered the ownership of the locomotive to the Trust. The 1225 not only was the locomotive used in the movie, but when asked, Chris VanAllsburg stated that it was the locomotive that inspired the story. He had visited the engine as a child when going to MSU football games with his father. The number 1225 inspired him to write the book. 12/25, is Christmas Day. Once the locomotive was accepted, Hannah tried to give it to the Engineering College. The Dean refused, saying that they didn’t need an antique piece of junk. Hannah then called Dr. Baker and told him that he was receiving a locomotive for the Museum. The University painted the locomotive once per year, just before football season, so that when Forest Akers went by, it looked nice. If it didn’t, Forest Akers would get on the phone and complain to Hannah. Forest Akers also insisted that the University have the locomotive open on Football Saturdays, so that people could view the engine. The budget for all of that stopped after Akers died, though Baker kept displaying the engine for a few more years. In truth, Jack Breslin was not thrilled to have the engine on campus. It was his opinion that once the restoration started, it was an eye sore. He put up with it, but told us that the day the restoration stops, is the day that the cutting torches come out. To make his point, he had the hopper car, on the siding next to the engine, cut up. When Edgar Hardin agreed to give us the engine, he was getting rid of something that some in the University had longed to see gone. A restoration of a steam locomotive in the middle of campus was not the image that Jack Breslin wanted to present to the public. Hardin was not against the Locomotive being located on campus. When the University stopped burning coal at the Shaw Lane Power Plant, the railroad announced that it would be tearing out the switch. The University wanted to pull up the track on campus. We needed to move the engine or face the possibility that it would become land locked forever. We got permission to pull up the track next to the display track and hook it to the display track so that we could back the engine out. For a while it sat on the curve next to the campus Police Station. Then it moved to behind Quality Dairy on Trowbridge Road. Dr. Hardin had a person from Landscape Architecture and Ted Simon of the Power Plant 65, go around campus with me to look at possible places for the engine. Ted Simon was not willing to give up any of his sidings. That meant that we would have to build our own and build our own building. That building had to meet University standards, so would cost a small fortune. We didn’t have anyway near that kind of money. Eventually, we got a lease of the old Ann Arbor Rail Road shop in Owosso, through the efforts of Hank Londo, and moved the engine. Chuck…..Thanks so much for that interesting additional background information about the 1225. I was a student at MSU from 1952 until graduating in 1956. My wife and I lived in the old student “barracks apartments” which used to be on the south side of campus and south of Macklin Field (now Spartan Stadium), but I do not remember the steam engine parked near the stadium at that time. It must have been moved in later or I have just forgotten about it. Our apartment was near the railroad tracks of the Flint to Chicago run and the whole building would shake when those huge steam engines roared by. We wondered if we could ever get used to the noise of the trains, but before long we were not conscious of them at all. Thanks again. Nick DeClerg mentioned above that the 1225 was moved onto the MSU campus in 1957. That explains why I don’t remember it as a student. I graduated a year before it was moved on campus. Thank you for all the great information about 1225!